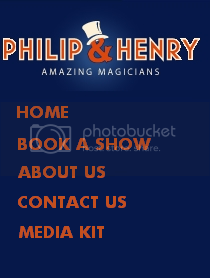 This is the official blog for Philip and Henry Productions, the magic show company. I'll blog about the company, a magician or two, and the state of the magic industry in general. One of the things I am bent on exploring here at Philip and Henry is how Magic or training to be a Magician can improve the self-esteem and confidence of a child, in both the short and long term. Magic stands out as being very non-competitive, and a way for a child to gain positive attention. Hi! Welcome to the Philip and Henry Blog!